The date for the 7th Annual Piedmont Regional Beef Conference has been announced. The conference will be held on Thursday, March 7, 2019, at the North Carolina Cooperative Extension, Guilford County Center in Greensboro, NC. 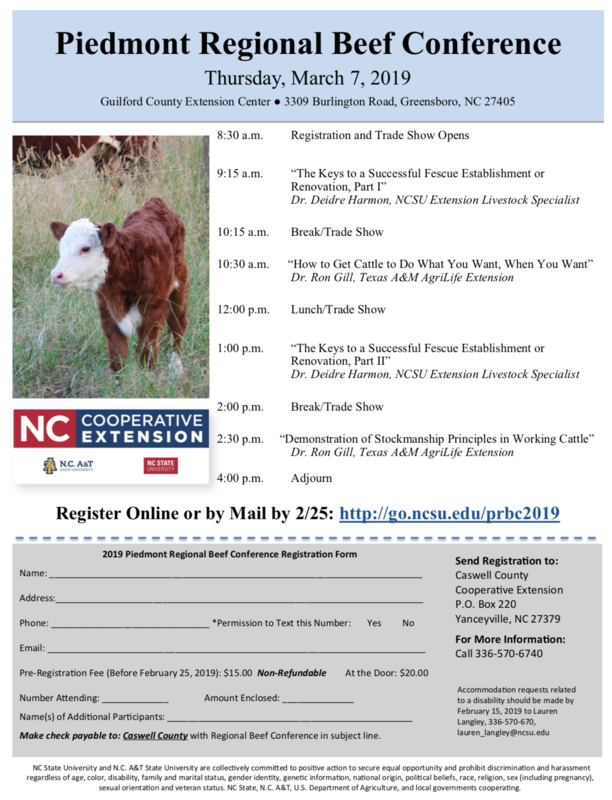 This year’s conference will feature cattle handling expert, Dr. Ron Gill from Texas A&M AgriLife Extension and Dr. Deidre Harmon from NC State Extension. Participants will have the opportunity to learn cattle handling and stockmanship skills as well as fescue pasture establishment and renovation techniques through classroom and demonstration sessions. There will also be a trade show featuring 20+ industry partners that offer feed, equipment, seed, fertilizer, cattle services, animal health, and more. Early registration is $15 or registration at the door is $20. Register online or through the mail by February 25. For More information, contact Lauren Langley (lauren_langely@ncsu.edu), 336-570-6740.